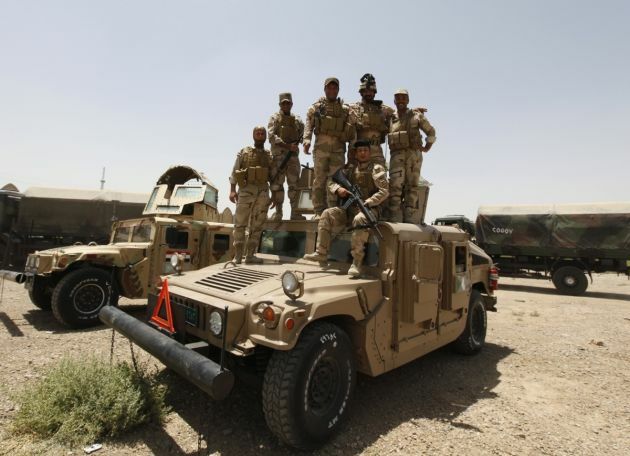 (Photo: REUTERS / Ahmed Saad)Members of the Iraqi security forces pose as they guard volunteers who have joined the Iraqi Army to fight against the predominantly Sunni militants, who have taken over Mosul and other Northern provinces, travelling in army trucks, in Baghdad, June 12, 2014. Since Tuesday, black clad Islamic State of Iraq and the Levant (ISIL) fighters have seized Iraq's second biggest city Mosul and Tikrit, home town of former dictator Saddam Hussein, as well as other towns and cities north of Baghdad. They continued their lightning advance on Thursday, moving into towns just an hour's drive from the capital. Christians in the northern Iraq city of Mosul are terrified with a Catholic cleric reporting "an apocalyptic situation" is unfurling as thousands of fighters from the ISIS group wreak terror as they move toward Baghdad. The Italian newspaper La Stampa reported Thursday in its Vatican Insider that it received an email from a Dominican cleric who said, "I am writing in a critical and apocalyptic situation." The cleric said, "The majority of the inhabitants of the city have already fled their homes and have ran away to the villages; they sleep out in the open without anything to eat and drink. "Thousands of gunmen of the Islamic State of Iraq and the Levant have attacked Mosul in the past two days." ISIS wants to establish an Islamic caliphate, or State, stretching across the region into Syria and other neighboring nations. "They murdered adults and children. Hundreds of bodies have been left in the streets and in the homes, without any mercy. Even the Army and the regular forces have abandoned the city, along with the governor. "From the mosques you hear the cry: 'Allah Akhbar, long live the Islamic state.'" In Washington U.S. President Barack Obama told reporters at the White House that the United States, "will not rule anything out" with regard to the conflict in Iraq. "This is an area that we have been watching with a lot of concern." The U.N. refugee agency said Wednesday that it was immediately stepping up its aid efforts in Iraq in response to the new massive displacement of people from the northern Mosul and other areas. One protection officer said UNHCR was working to provide shelter, protection and emergency items including tents to some of the many thousands of people believed to have fled from Iraq's second largest city. "The needs are immense," said Gemma Woods. "While the numbers of those crossing from Ninewa governorate into Iraq's Kurdistan region today were visibly less than the long line of cars and pedestrians I witnessed yesterday, thousands continue to flee." The U.N. agency said the exodus from Mosul began earlier this week, following massive displacement this year in the western Iraqi governorate of Anbar. There fighting since January has forced around half-a-million people to flee the province or seek shelter in safer areas. Local authorities say that as a result of the new outflows from Mosul a further 300,000 additional people have arrived in the past days.